Add more style & glamour to your looks with this sensational light sky blue colored suit. This suit stylized with beautiful khatli hand work which makes this suit more demanding among people. 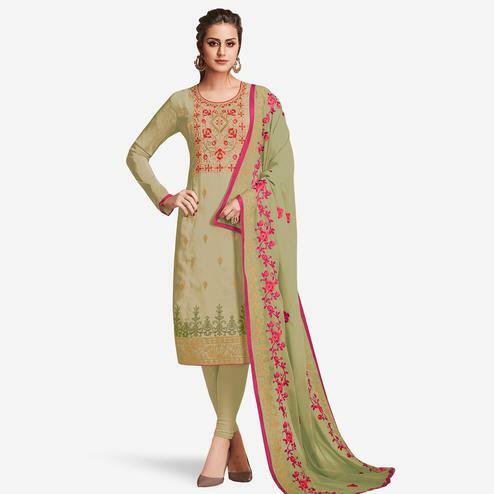 This suit is made of pure uppada silk fabric, comes with unstitched santoon bottom and embroidered pure organza dupatta. This outfit is perfect to wear at parties, functions & occasions, where you want to be center of attraction. Team this suit with ethnic accessories and high heel for a complete look. This attractive suit will surely fetch you compliments for your rich sense of style. Note:- The actual product may differ slightly in color and design from the one illustrated in the images.